Answers to general information about Salt Lake City is featured on this page of our 2019 Visit Salt Lake.org Travel Guide. Salt Lake City, Utah is in the Mountain Time Zone and follows Daylight Savings Time. For International visitors, we are 2 hours behind New York, so if it's 8am there, it's 6am here, and 1 hour ahead of the West Coast, California time. Latitude: 40 degrees, 47 minutes north. Longitude: 111 degrees, 57 minutes west. The Salt Lake City International Airport is within 2.5 hours from half of the nation's population. The airport is situated just west of Salt Lake City and about 10 minutes from downtown and serves more than 20 million passengers annually and ranks as the 27th largest airport in the nation. The airport also ranks as one of the most cost-efficient, large hub airports in the United States. The airlines serving Salt Lake City operate over 750 daily departures to over 100 nonstop destinations throughout the U.S. and Canada. Salt Lake City International Airport is typically ranked in the top 10 U.S. airports for on-time performance by the U.S. Department of Transportation. Salt Lake City serves as a major western hub for Delta Air Lines. This hub enhances Utah's economy in employment and facilities. The following commercial airlines operate from Salt Lake City International Airport: America West, American, Continental, Delta, Frontier, JetBlue, SkyWest, Southwest, TWA and United. Interstate 80 (east to New York City / west to San Francisco), Interstate 15 (north to Canada / south to Mexico) and Interstate 70 (east to Denver) are vital to the efficient movement of goods and materials throughout the region. Both I-80 and I-15 cross in Salt Lake City allowing convenient access to the Wasatch Front and points beyond. The I-215 belt route offers expanded access along the eastern and western areas of the valley. The airport is located about ten minutes west of downtown Salt Lake. Taxis, limos, buses and shuttles supply service to anywhere in the valley and the local ski resorts. A one-way taxi from the airport to downtown is usually around $ 28.00. Some of our Salt Lake City Hotels provide free airport shuttle services, so call them before you arrive to make arrangements. 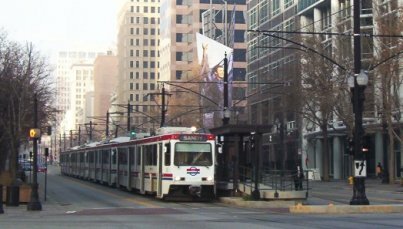 The UTA ( Utah Transit Authority ) provides an extensive bus & light rail ( TRAX ) service throughout the valley. Fares are $2.50 within the valley. They also provide airport transportation, service to the ski areas and door to door service for disabled passengers. For more info visit Utah's Ski Bus. Salt Lake City, city in Utah, state capital, and seat of Salt Lake County. Located in the north central part of the state, it is 24 km (15 mi) east of its namesake, the Great Salt Lake, and lies along the western slope of the Wasatch Range. The entire Salt Lake Valley was once part of the basin of ancient Lake Bonneville. Today, the Jordan River passes through the city. Salt Lake City is the international headquarters of the Church of Jesus Christ of Latter-day Saints, commonly known as the Mormon Church. It is the largest and most important city in a large region of the interior West and serves as the industrial, financial, religious, and commercial center of Utah. Salt Lake City has a dry climate, with only 411 mm (16.2 in) of precipitation per year. However, the mountains in the Wasatch Range are well watered, and the runoff is used to water the valley. The average July daytime-nighttime temperature range in the city is 33 to 18 C (92 to 64 F), and the average January range is 2 to -7 C (36 to 19 F). Salt Lake City lies high above sea level in a mountain valley flanked by the Wasatch Range to the east and the Oquirrh Mountains to the southwest. Salt Lake City proper is relatively small, only 282.5 sq km (109.1 sq mi) in land area. However, the Salt Lake City-Ogden metropolitan area includes all of Salt Lake County, Weber County, which includes the city of Ogden, and Davis County. The metropolitan area includes 4,189.3 sq km (1,617.5 sq mi). The city is also at the heart of a larger metropolitan corridor called the Wasatch Front. This is a strip of land running north and south along the western slope of the Wasatch Range. It stretches about 160 km (about 100 mi) from Spanish Fork on the south to Brigham City on the north, and includes the major Utah cities of Springville, Provo, Orem, American Fork, Lehi, Sandy City, Taylorsville, West Valley City, Bountiful, Farmington, Kaysville, and Layton. Downtown Salt Lake City is noted for its broad streets and spacious blocks, a legacy of the Mormon settlers who laid out the city in 1847. The city was built on a grid system based on the four streets bordering Temple Square, the focus of the downtown area. Inside the square is the Mormon Temple, which took 40 years to build from 1853 to 1893. Other important buildings are the Salt Lake City and County Building, the Mormon Tabernacle, the Church of Jesus Christ of Latter day Saints Conference Center, the Roman Catholic Cathedral of the Madeleine, the Salt Palace Convention Center, and the Energy Solutions Arena. Ten blocks west of Temple Square lies the Utah State Fair Grounds, and the Utah state capitol stands four blocks to the northeast. South of Temple Square is the city's central business district. The main campus of the University of Utah is situated about 3 km (2 mi) east of the city center. The city's population declined from 163,033 in 1980 to 159,936 in 1990 as residents moved to the suburbs. Since then the population has increased, and by 2019 it was 181,743. According to the 2019 census, whites are 79.2 percent of the population, Asians 3.6 percent, Native Hawaiians and other Pacific Islanders 1.9 percent, blacks 1.9 percent, and Native Americans 1.3 percent. People of mixed heritage or not reporting their ethnic origins are 12.1 percent of the population. Hispanics, who may be of any race, are 18.8 percent of the people. The metropolitan area has 1,333,914 people, compared to 1,072,227 in 1990. Salt Lake City has been at the forefront of education in Utah since 1850, when the University of Deseret was founded. Renamed the University of Utah, it now ranks as Utah's largest institution of higher education. Westminster College was founded in 1875 as a mission school of the Presbyterian Church and remained under Presbyterian control until 1974, when it became a secular institution. The Salt Lake Community College is the state's largest two-year institution. It was founded in 1948 as the Salt Lake Area Vocational School. Prominent cultural and historical institutions in Salt Lake City include the Utah Museum of Fine Arts and the Utah Museum of Natural History, both associated with the University of Utah. Important Mormon institutions include the Church of Jesus Christ of Latter-day Saints' Museum of Church History and Art and the adjacent Family History Library, which is famous as a center for genealogical research. Other popular destinations in the city include Beehive House, the former home of Mormon leader Brigham Young; the Pioneer Memorial Museum, which houses pioneer artifacts such as 19th-century furniture; the Utah State Historical Society, located in the historic Denver and Rio Grande Railroad Station; and This Is The Place Heritage Park, which includes Old Deseret Village, a re-created village illustrating daily life in pioneer Utah. Salt Lake City is home to a number of performing arts groups, including the world-famous Mormon Tabernacle Choir, the Utah Symphony, and the Utah Opera. Cultural events include Pioneer Day on July 24, which celebrates the arrival of the Mormons to the Great Salt Lake Valley; the Church of Jesus Christ of Latter-day Saints Semi-Annual Conference, held in April and October; and the Utah State Fair in September. Around the city, the Wasatch Range provides excellent opportunities for hiking and downhill and cross-country skiing. Six major ski areas, Alta, Snowbird, Solitude, Brighton, Park City and Deer Valley are less than an hour's drive from downtown. The Vivint Smart Home Arena is the home of the Utah Jazz of the National Basketball Association (NBA). To the east of the city, Hogle Zoological Gardens has many animals and birds and a children's zoo. The city has several fine parks, including Memory Grove, which honors Utah's war dead along City Creek Canyon just north of downtown; Liberty Park, the city's oldest, which includes the Brigham Young Grist Mill and a folk art museum; and Jordan River State Park, where more than 20 countries are represented in the International Peace Gardens. Red Butte Garden and Arboretum, a part of the University of Utah, is one of the city's most popular parks. Located in the mountains just east of the university, it includes more than 150 acres of gardens and natural areas. Salt Lake City has a diversified economy. The mining of materials, including copper, silver, lead, zinc, coal, and iron ore, is important to the city's industrial base. Southwest of the city is Bingham Canyon, which includes the Kennecott Copper Mine, one of the largest open-pit mines in the world. Church, government, finance, education, research, high-technology industries, transportation, recreation, and tourism account for most of the city's employment. Among the city's largest employers are the federal and state governments, the Church of Jesus Christ of Latter-day Saints, the University of Utah, Kennecott Corporation, and Delta Airlines. The city's Salt Lake City International Airport is a regional air passenger center. Amtrak provides the city's passenger rail service, while Interstate Highways 15 and 80 intersect in the city. In recent years, a booming economy along the Wasatch Front has brought tremendous growth that has strained the area's aging interstate highway system. For many years, efforts by the Utah Transit Authority to develop a rail transportation system for Salt Lake City were controversial. However, public support for an efficient transportation system increased in 1995 after the city was designated to host the 2002 Winter Olympic Games. As a result, in 1999 the Utah Transit Authority completed a 24-km (15-mi) light-rail transit line, known as TRAX, that runs from downtown Salt Lake City south through the center of Salt Lake Valley. The system was so successful that a 4-km (2.5-mi) east-west line connecting downtown Salt Lake City with the University of Utah was undertaken and completed in 2001. Other preparations for the Olympics included rebuilding parts of Interstate Highways 15 and 80, redesigning or upgrading other critical transportation routes, and adding a runway to the city's airport. Salt Lake City is governed by a mayor and a seven-member council, which is presided over by a chair. Voters elect each of these officials to four-year terms. Salt Lake County is governed by a county mayor elected to a four-year term and a nine-member county council. Council members six elected from districts and three elected at-large-serve terms ranging from two to six years. The Utah Transit Authority, located in Salt Lake City, oversees public transportation in the city and surrounding areas. The Wasatch Front suffers the worst air pollution problems in the state. In the Salt Lake City area during the winter, atmospheric inversions can trap pollutants such as ozone and carbon monoxide near ground level, producing a dense smoglike cover. In the late 2000s nearly 100,000 metric tons of toxic chemicals were released into the state's air each year, the fifth highest total in the nation. The city has a low housing vacancy rate, due to the rapid job growth, and housing costs have been rising. This, coupled with the fact that one-sixth of city residents have incomes below the poverty threshold, means that affordable housing has become scarce. Homelessness has also been a concern, with the city's homeless shelters usually being full to overflowing. Native Americans lived in the Great Salt Lake Valley for thousands of years before white settlement. The Shoshone, Ute, and Paiute peoples were among those Native Americans living in the area when the Mormons entered the area in July 1847. Since the founding of their church in New York in 1830, the Mormons had been moving west because of persecution. Finally they moved to the Far West to find an isolated land. Upon arrival in the Great Salt Lake Valley, Brigham Young declared, "This is the right place." Young laid out the community in 4-hectare (10-acre) plots around Temple Square, which became the center of the Mormon faith. In 1849 the Mormons organized a new state, which they named Deseret. The Congress of the United States, however, did not grant statehood, and instead created Utah Territory in 1850 with its capital at Great Salt Lake City (the name was shortened to Salt Lake City in 1868). The population soared with a steady influx of Mormon converts. Salt Lake City incorporated in 1851 and was designated the capital when Utah became a state in 1896. The Mormons' practice of polygamy (having multiple wives) and their alleged disregard of federal authority led to conflicts with the federal government. In 1857 a dispute called the Utah War began because the U.S. government believed that the Mormons were undermining federal laws. Federal troops marched through the city but found that it had been evacuated. There was no fighting, and they moved on to set up a post, Camp Floyd, about 65 km (about 40 mi) to the southwest. Fort Douglas was built on the eastern edge of the city in 1862. The city's economy was strengthened with the completion of the first transcontinental railroad in 1869 and a railroad connection from Salt Lake City to the transcontinental railroad in 1870. Mining increased with the arrival of the railroad, and the city's population more than doubled in the 1880s. After the nationwide depression of 1893, the population resumed its rapid growth, passing 50,000 by 1900 and 140,000 by 1930. In 1890 the church leadership issued a manifesto advising church members to abstain from polygamy. The manifesto helped pave the way for Utah to become a state in 1896. Increased demand for metals during World War II (1939-1945) created a new mining boom, and a period of industrial expansion followed the war. In the mid-20th century the population of the city remained stable while the metropolitan population soared. The completion of several downtown projects since the 1970s, including the Church of Jesus Christ of Latter-day Saints Church Office Building, The City Creek Center, Maurice Abravanel Hall, Vivant SmartHome Arena, the Salt Palace Convention Center, and the Gateway Center, has helped to maintain a viable city center. In 2002 Salt Lake City hosted the Winter Olympic Games. Contributed By: Allan Kent Powell, B.A., M.A., Ph.D. Adjunct Professor of History, Westminster College. Field Services Coordinator, Utah State Historical Society. Author of The Utah Guide. Editor of The Utah History Encyclopedia. "Salt Lake City," Microsoft Encarta Online Encyclopedia 2019 Copyright 1997-2019 Microsoft Corporation. All Rights Reserved.